From all ringed Black-headed Gulls which I read, since the fall of 1986 I am making notes on what percentage of the head is black. In addition to this, I have access to readings from some observers as well as the percentage of blackness. Taken together, I have obtained 52,500 observations of the percentage of blackness. The Black-headed Gulls have a summer- and winter plumage. In summer they have a completely black (or more precisely a chocolate brown) head and in winter they have a white head with the so-called black earphone. At the end of February / beginning of March (late), most of the Black-headed Gulls heads transform into a black head. But some Black-headed Gulls already obtain a black head. At (the onset of) November these show a black head. These early moulting birds show this early every year. The Black-headed Gulls which moult late do this very quickly. As much as 10-15% a day. Hence, in March the head can turn black in a week. The early moulting birds do this very slowly, at a rate of about 1% in a single day. Thus, there is more variation in the onset of moulting as opposed to the timing when the head is completely black. The onset of the moulting of the head in late birds is dependent on winter temperature. In a severe winter they begin about ten days earlier as opposed to mild winters. The early moulting birds do not care much about the winter temperature and their onset is in November in each year. 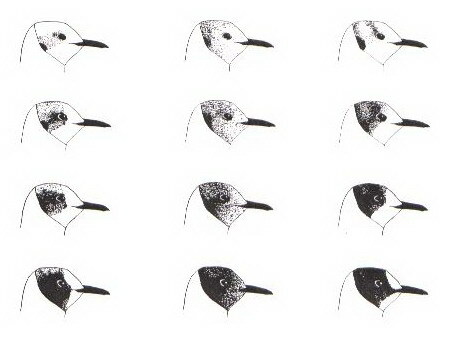 The pattern of moulting of the head from winter to summer plumage is unique for every individual, in other words, every individual has its own moulting pattern in any given year. For a given individual moulting starts at the beak, whereas for another individual it starts at the back of the head, and for a different individual it starts with small spots anywhere. 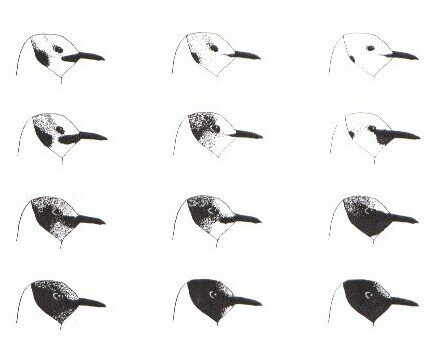 Also the pattern of the winter plumage, the so-called earphone, is the same for each individual. From a very small patch behind the eye, to two very broad bands across the entire head.